Beijing - The name Sherlock Holmes conjures up images of a sharply dressed and witty Englishman with a wry smile and a keen eye. So diehard fans of the fictional sleuth may be disappointed if they met Wu Guoqing, the famed detective known as "China's Sherlock Holmes". With his unhurried attitude and pleasant, modest demeanor, the 76-year-old seems to share only one trait with Arthur Conan Doyle's legendary character: exceptional powers of perception. Despite officially retiring in 1995, Wu remains the country's top forensic expert, having cracked 1,000 cases, including several that stirred media frenzy. Among his biggest achievements are helping to convict the arsonist who launched a 2002 attack on a tour bus in Huizhou, Guangdong province, and finding vital evidence against Ma Jiajue, a student who murdered several classmates at Yunnan University in 2005. Even today he continues to travel across the nation - usually more than 200 days a year - to walk crime scenes and check for clues. "As crime scene investigation is crucial to uncover the truth and hunt down the criminals, I have to be there," he told China Daily during an interview at his home in Beijing. 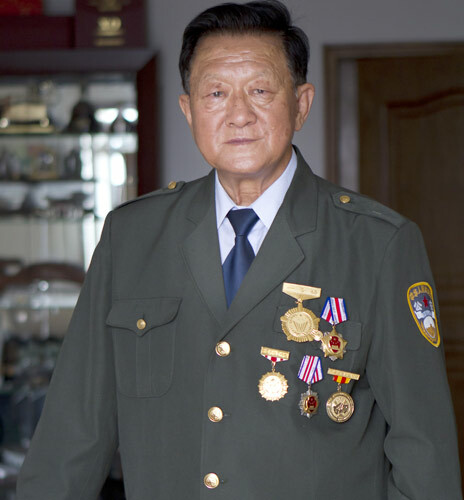 Set against the wall of his living room is a glass cabinet where his wife carefully displays the dozens of medals and awards Wu has received throughout his 50-year career. His most recent prize came in June this year when the Ministry of Public Security presented him with a lifetime achievement award. Born and raised in North China's Inner Mongolia autonomous region, Wu was one of the country's pioneers in forensic crime investigation. After spending 14 years on horseback on the vast Keerqin grasslands, in 1949 he was admitted to Chengde Medical College in neighboring Hebei province, where he studied medicine and Chinese culture. Four years later, he moved to the Shanghai Institute of Forensic Medicine. Due to his excellent performance at school and in the field, in 1956 he earned the chance to continue his education for four more years in Shanghai under the instruction of experts from the then-Soviet Union. Wu says this period laid the "theoretical foundation" of his career. "In a sense, I owe everything I learned to the people and our country," he said. "I was a complete illiterate before I stepped out of the grassland. I didn't even know how to read a clock." To show his gratitude, Wu said he has devoted his life to forensic investigation. "I took to the work immediately, enjoying the investigation and reasoning process and, above all, the moment when we crack a case," he added. Wu's colleagues compare his appearance on the crime scene to a flashlight coming to assist people in the dark and often joke he must have a "sixth sense". Wu brushes off these compliments with a humble smile, yet the impact he has made in crime fighting is obvious. On March 4, 2002, a tour bus heading for Shenzhen exploded in Huizhou, killing more than 30 passengers, including several Hong Kong tourists. By the time Wu arrived at the scene 12 hours later, police had already completed their investigation and believed the cause was arson, possibly started by a passenger on the back seat. However, they were struggling to find the evidence they needed to nail a suspect. They desperately needed a breakthrough, and after several hours of sifting through evidence from the scene of the blast, Wu found them one - a small spring overlooked by police. "An explosion is usually controlled by a timer and a timer always needs a spring," he explained. "I knew that the spring would lead us to the arsonist." And he was right. Detectives later found packaging for the spring outside a window of the prime suspect's home. The case was solved within 84 hours, setting a new national record. Recalling such cases, Wu tells the tale with his trademark smile. "I'm like most people, only I pay close attention to details that others tend to ignore." Thanks to his dedication and shrewd observational skills, Wu built a reputation as a master sleuth. In the 1980s, when Conan Doyle's novels were popular, he was dubbed "China's Sherlock Holmes" and has carried the nickname ever since. Even when he attempted to hang up his magnifying glass in 1995, it was not long before the Ministry of Public Security coaxed him back into the field. He also now lectures students nationwide on forensic investigation. With the pensioner spending so much time on the road, his wife Cao Xiupeng admitted she has concerns about the effect on his health. However, she said she knows solving crime is his passion. "I know him too well. He loves his work and he won't quit as long as he can still manage it," she said. "He can eat, sleep and work anywhere, any time, which actually helps prevent me from worrying too much about his health on the road."